Last weekend, the missus and I popped over to the Ikea store in Edmonton, London, for our quarterly session of look-at-many-things-but-buy-only-cheap-things therapy. This massive hipster heaven on earth is some distance from home—it requires changing two trains and a bus. But can anything come close to that feeling of awe when you go up that first escalator from ground level and walk into football fields full of minimal Scandinavian design and thoughtfully put together faux living rooms and fake dining rooms? Sigh! I don’t know about you, but for me, Ikea doth make the heart groweth fonder. One of the things I really like about Ikea is that many of their products have been made keeping the tech geek in mind. This might not seem immediately obvious amid all the soft furnishings and ceramic bowls. But look, for instance, at the fabric remote control storage thing they have that drapes over one arm of your sofa. It is essentially a piece of tough fabric that has been stitched with a thin counterweight on one side and a set of pockets and pouches on the other. You drape this over the arm of your sofa and tuck the counterweight in underneath your seat cushion. Now, you don’t have to lose sleep over where you’ll keep your plethora of remote controls out of sight but always within reach. Just drop them into the pouches on the outside of your sofa. Genius. The unit I bought a few months ago also has a loop of fabric that can be used to keep newspapers, magazines or a tablet, if you wish. Which is useful, but take it one step further. You can actually use it to hold a little electric distribution strip, loop the wire underneath the sofa and plug it into the wall. Et voila! You have a discreet power point right by the side of your sofa, which you can use to charge phones or a laptop. And if you loop the wire correctly, there will be nothing for little children to trip over either. What I did end up buying this week is a kit used to manage and conceal cables. This is basically a long piece of stiff plastic tubing with the seam left open and a bunch of cable ties. For those who have never seen the thing, the idea is best illustrated with my real-life cable crisis. My living entertainment arrangement involves a TV, a home theatre, a set-top box, an Apple TV box, a wireless router, a PS2 and a little Amkette Flash device that plays videos off hard drives. 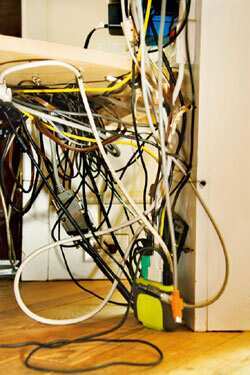 The criss-cross tangle of wires is an unbelievable mess. When you adjust one of the home theatre speakers, your router falls off the table. And when you pick up the router, the kettle starts boiling water. The idea with the cable kit is to use lengths of the plastic tubing to group together cables and route them from device to device. For instance, the set-top box pulls power and two video feeds from adjacent wall sockets. Usually, the three wires start close to each other and then go their separate ways only to come together again at the box. You can easily feed the whole thing through one tube, secure them in place with cable ties, and clean up that mess. It took me the better part of 3 hours to group all the wires, eliminate unnecessary ones, remind myself again why some of them exist, and then tuck them into the tubing. The take-away meatballs in the fridge were fully earned by evening. But that experience did teach me a few lessons about what entertainment devices to buy next time. For instance, always make sure your home theatre has an audio-out port in addition to speaker ports. That way you can eliminate the speakers and use the TV’s speakers if you want. Which also means that the TV needs an audio-in port. In fact, the TV should have as many input ports as possible. Just in case. But the best thing to do, I think, is to eliminate any device you haven’t used in two weeks. No. Don’t think about it. Pick it up. Put it away. Eliminate the cabling. So I’m really sorry PS2, but you will have to go. Cheer up. Your new home is a funky cane basket from Ikea. How cool is that?